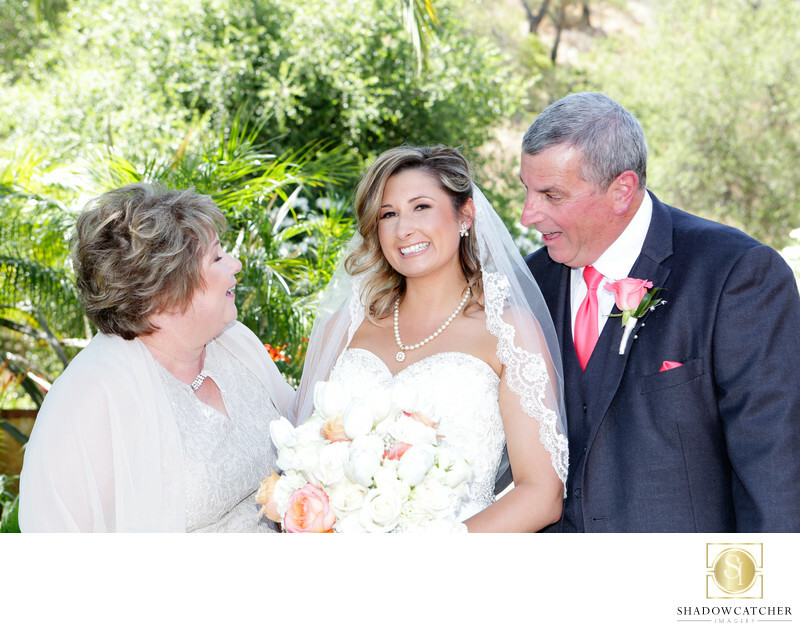 Our Bride and her parents before she walks down the aisle at her Los Willows Wedding. Family interactions are key to setting the mood for wedding photos. We can set up formal portraits all day, but it is the candids that really reflect the day! If we can get a little unposed interaction between the bride and her parents, that's more of a memory for them, and her, than any formal posed image. Here, we told dad to say something to the bride, anything at all. Mom is reacting to it, while the bride tries to maintain her composure...I like it! As photographers, whether for weddings, family shoots, personal photography or anything else that involves a camera, we strive to capture moments, not just photos. I feel that this image, like so many of ours, do exactly this. Shot with a Canon 5D mkIII and 24-70 f2.8L lens, the sharpness of the lens combines with the high resolution of the camera to pick up every detail. A little fill flash helps balance the faces with the brightly lighted background. Keywords: candid wedding photographer (3), los willows wedding (33), wedding photography for los willows (3).